ANN ARBOR, Mich. - Michigan Athletic Director Warde Manuel released a statement Sunday, saying he made a mistake in hiring a former USA Gymnastics executive who's been linked to the Larry Nassar sexual abuse scandal. Rhonda Faehn agreed to work as a coaching consultant for the University of Michigan women's gymnastics team, the school confirmed Saturday after The Michigan Daily reported the hire earlier in the day. USA Gymnastics parted with Faehn as senior vice president after she was criticized by Nassar victims for being alerted to potential abuse concerns and not going to authorities. Survivor Aly Raisman, a six-time Olympic medalist, was among the victims to raise concerns about Faehn. 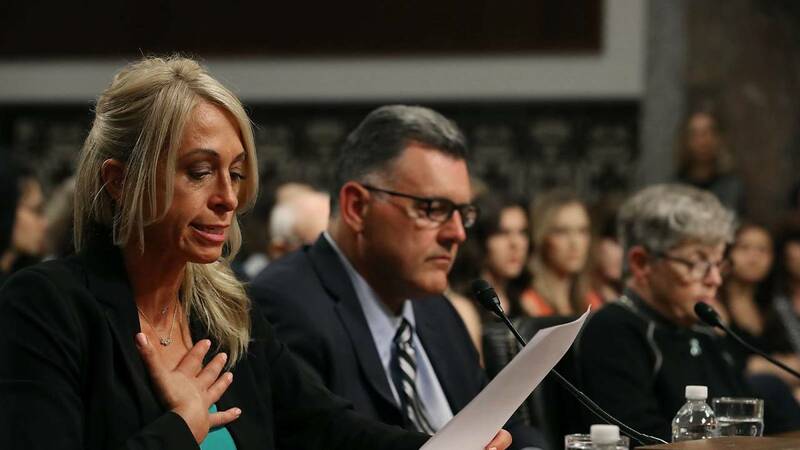 Faehn said she passed along the concerns to then-USA Gymnastics President Steve Penny, who has since been arrested on accusations he ordered Nassar files to be removed from the team's training center in Texas. Manuel said he supported hiring Faehn because of a recommendation made by gymnastics coach Bev Plocki. "After our exhaustive due diligence, we felt comfortable that Faehn reported all information available to her regarding Larry Nassar and that she cooperated fully, including voluntarily participating in all investigations and offering testimony before Congress. Neither an internal investigation by USA Gymnastics or a criminal investigation by the FBI have assigned culpability or resulted in any charges against her." After three days of outrage following Michigan's agreement with Faehn, Manuel ended the relationship. "I have come to the conclusion that it is not in the best interest of the University of Michigan and our athletic program to continue the consulting contract with Rhonda Faehn," Manuel said. "It was the wrong decision, and I apologize. Our student-athletes are our highest priority and I want to do everything in my power to support them fully and put the focus back on their athletic performance."